These are the words of Masuma, a young girl from Jirghai in rural Afghanistan. Masuma is in year 10 at Shebar School. Two years ago, she was sitting in makeshift classrooms on the floor. Her parents were contemplating taking her out of school. Today, thanks to your support and the commitment of the Jirghai community, Masuma and her friends sit in a new building, in classrooms with desks and chairs, a library and books. And she has her parents’ support to stay in school. “I used to attend my classes under the old tents and empty shops. and it was very difficult for me to concentrate on my lessons because of the cold weather and wet ground in early spring and late autumn and hot weather in the summer. The outside noise around the shops also disrupted our learning. In previous years, I know many girls left school when they reached grade 9 because of the open spaces and poor school conditions.” says Masuma. The prospects facing girls and young women in Afghanistan are bleak – 4 out of 10 schools do not have buildings and two thirds of girls do not attend school. But Masuma, with her strong sense of self and backed by the Jirghai community’s commitment to equal education, is bucking the national trend. She is determined to stay in school and wants to become a teacher. indigo foundation has invested in education in Afghanistan for 15 years, first across a network of schools in Borjegai, and now in the neighbouring province of Jirghai. And over time, student prospects have changed. A girl born today in Borjegai will be able to go to school. Her school will be safe and furnished. She will have clean water and access to separate female toilets. She will see female teachers at her school and it will be within her reach to go to university. As we approach 30 June, we are asking you to make a donation so we can reach the next generation of students in Jirghai and improve education outcomes across all of our partnerships. We see stories like Masuma’s repeated across the communities we partner with – where girls and young women, strong in their sense of self, are determined to get an education, gain their independence and become leaders in their communities. From Dalit children in the slums of Madurai in India attending after-school tuition centres five days a week so they can stay in school, to young women in South Sudan and Eastern Indonesia returning to study after dropping out, to girls in Uganda who no longer have to miss out on school when they are menstruating because they have access to sanitary pads. You can read more below to find out more about what has been achieved by our partners in Afghanistan and South Sudan and their plans for the coming year that we need your help to make happen. Your support will mean that we can partner with a new network of schools in Jirghai in coming year – building classrooms, stocking libraries, ensuring there is clean water and separate female toilets. It will mean that we can continue to train a cohort of 60 teachers in South Sudan and work with local grassroots organisations in Indonesia, India and Uganda to improve the chances that kids – and girls especially – will be able to stay in school and graduate. $26 will provide one year’s supply of reusable sanitary towels for twenty girls made vulnerable by HIV and poverty in Uganda, supporting their dignity and their right to stay in school when they are menstruating. $170 will support one after-school tuition centre for two months in the slums of Madurai in India, including tutor salaries and education materials for Dalit children. $992 will support eight teachers through a one month intensive teacher-training program in Aweil, South Sudan. You can trust that your support will be life-changing for students, families and whole communities in places where children and young people are excluded from school and where girls have an uphill battle to get an education and the independence that brings. When it comes to international development and human rights, we know you have choices about where to direct your support. With indigo foundation, the power of local community development is unleashed through respectful long-term partnerships. We are proudly small, nimble and 100 percent focused on the impact communities can achieve. Our work is driven by the community at every step and, in the case of our Afghan and South Sudan programs, guided in Australia by Partnership Coordinators who themselves are former refugees from the communities in which we work. Your donation will make an exponential difference in communities not reached by other non-government organisations and donors. Number of female teachers increased from 0 to 9. With your support, we want to work towards repeating those outcomes with the Jirghai community. This year has been the biggest year yet for our Afghanistan partnerships – and we are excited to share our partnership recently received national recognition by the Afghan Ministry of Education. 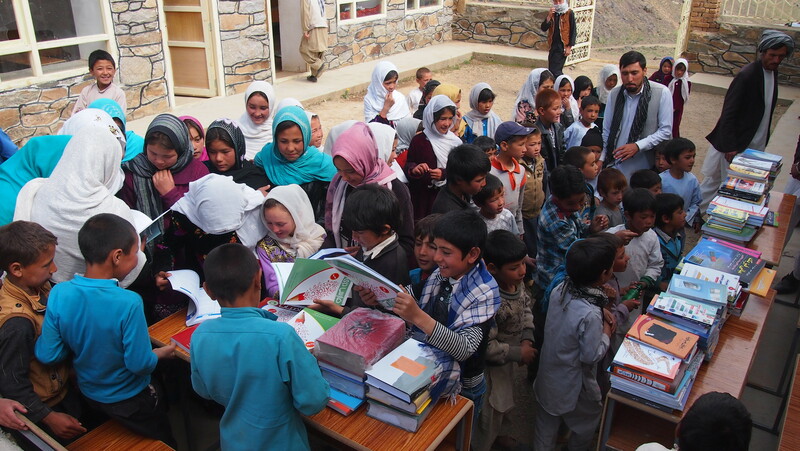 As well as working in Kabul with the Women’s Empowerment Centre, we have partnered with the community in Jirghai to fund furniture for four schools, purchased and delivered over 3,000 books to five schools and constructed a new building for Qaraqul High School. These works have benefitted 1800 primary and secondary students, including Masuma. Importantly, the partnership has also moved for the first time into a new province in Afghanistan – gaining momentum as neighbouring schools see the outcomes and want to jump on board. The Jirghai community has big plans for the coming year – building classrooms, stocking libraries, ensuring there is clean water and separate female toilets across a network of four more schools. We are asking for your donation so that we can work with the community in the coming 12 months to help them reach their goals. In 2013, we began working with the war-devastated community of Wedweil in South Sudan – the first time that community had partnered with an international organisation – to rebuild a school, construct the first onsite toilets and train 25 local teachers. Following this, student numbers at Wedweil School increased by more than 25%. Children who had never been to school, or who had stopped going to school at the height of conflict, started returning. Again, this shows what can be done when programs are led by the local community – both on the ground in Wedweil and in Australia through strong links with the South Sudanese refugee community and our Partnership Coordinator Santino Yuot. But there is still much to do with our partners in Wedweil. The classrooms are crowded, textbooks are scarce, teachers often go unpaid and many children arrive at school every day without having eaten. The Wedweil community has a clear vision of how they want to invest in education and we are committed to partnering with them to build on these early successes. In just the last few months, we have supported the community to install a new water pump at the school giving access to clean water and we are mid-way through a project to build a fence around the school so the students and teachers can get a food garden started – vitally important given the food shortages in South Sudan. In March, we worked with our partner and the local Ministry of Education to hold an intensive one-month training course for 60 teachers from three provinces. This is incredibly ambitious for our local partner but their commitment is paying off with TV coverage across South Sudan of the teachers graduating from the first round of training. We need your support to continue this training over the next two years and to get the school’s food garden up and running.